Child labour is said to have born as the outcome of the Industrial Revolution, when new industries cropped up and the capitalist owner, started engaging, with cheap labour in mind, children to work in their industries, at low wages, and thereby earn more profit. In that age, people were unaware of the value of the child’s labour – they were entirely dependent upon their master’s will, being illiterates. (c) More than 50 percent of these girls have to do hazardous work. Number of children in India is estimated to be 259.64 million and of these 4.35 million are child labours. Domestic Help: Large number of children, mostly girls, are employed as domestic help (servant) in the houses, where they are made to do all the manual chores like dusting and cleaning the house, washing utensils, preparing tea and food, washing clothes and at times going to buy groceries. More girls are employed in this work than boys. Invisible work: Where girls are not engaged, fulltime outside, they have to perform the entire manual work of their houses, before going to take up work outside in agriculture or industry sectors. The works done by girl child in her own house remains uncalculated and invisible. In fact, such household work done by little girls in their own homes are truly economically active work, and should be duly counted as ‘service’ like that done outside, and given due credit. These girl children are deprived of education and get no leasure and rest – they work for more hours than boys. (c)Working in tea shops, roadside dhabas and eateries, restaurants and hotels, resorts and spas, recreation centres etc. (d)Working at construction sites, manufacturing centres, mines and industries. The Child Labour (Prohibition and Regulation) Act 1986 prohibits employing child (5-14 years old) as labour and infringement of this provision is liable to prosecution and penal action. The ILO Convention 138(1973) and 192(1999) and the Article 32(1) of convention on the Right of Child (1989), which was duly ratified by India, entailed protecting the child from engaging him to do any hazardous work, harmful to his physical and mental health and which interfares with his education, social and moral upbringing. The Article 24 of the Constitution of India also prohibits engaging any child under 14 years of age as labourer. But, despite the preventive legal measures, large number of children are employed in industries, where they are forced to undertake delicate, tedious, wearisome works. The handmade carpet company of Bhadohi (Mirzapur), Hathkargha Udyog of Varanasi, Carpet industry of Jammu and Kashmir, Glass factory of Firozabad, Brassware industry of Moradabad, lock-making works of Aligarh, Slate industry of Markapur(AP) and many others ,employ children on low wages as labourers. 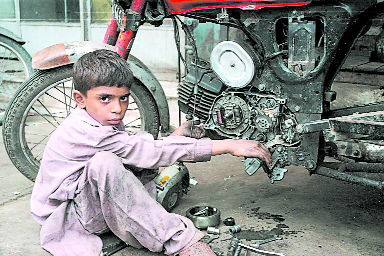 In domestic sector like homes, jewellery and garment making shops, auto-repair points, children are engaged. When a family migrates in search of job, children also accompany and they are made to work as labourers, along with their parents, at construction sites, brick kilns, mica belts and stone quarries etc; Undertaking work, beyond their tender age, children undergo a very painful life and living at these places. (a former child labour) is still haunted by a nightmare of 2010, working in an open-pit mine at Chanako village, Kodarma district. He says, “I am in a mine and I see this shining piece of mica. I try to grab it but it is out of reach. I walk towards it but it moves further away. And then, the mine collapses.” Ranjit Kumar, eight years old then, remained suffocating in the debris for a few minutes, before he could be rescued. The mica belt is spread over 4,000 sq. km. where nearly 500 villages are dependent on it and about 60,000 children are found at risk in this mica trade. For adults, it is a family-work to earn for living; for children it is risk-taking job, involving head injuries, silicosis and tuberculosis like diseases. Beed Rolling: Similarly, Kunti, belonging to a daily-wage-working family, has a depressing story to tell. She, barely under teen, has to put in at least two hours in beedi rolling and again three hours in the evening in this work. She has to complete besides doing other work, 500-600 beedis everyday, to earn (small sum) to supplement her family income. She is desirous of going to school, but her mother says, “her books will not feed us, she should roll more beedis to earn more; to save for her marriages”. And ultimately she drops out of school to roll beedis fulltime. There are hundreds of Kuntis, facing situation like this, when their childhood is lost. Working with toxic products they are prone to diseases like respiratory disorder, skin alergy, tuberculosis etc. From Labour to Bonded Labour: Labourers move from their native places to far-off districts and states to find job. They shift with their entire families including children and settle to live at the very construction sites for their convenience. Being paid wages at low rates and that too fortnightly only, they need extra money at the time of their needs like illness etc. The employers, exploiting the situation, lend money on high interest rate; making inflated entries in their registers, unknown to the illiterate labour. The amount goes on multiplying, the labourer being financially incapable to pay back. And ultimately, the labour is reduced to become ‘bonded labour’ – made to serve his employer, all time to come. In 1976, Bonded Labour System(Abolition) Act was enacted. This Act made the system and practice of bonded labour as illegal and vested power with District Magistrate to eradicate it and rehabilitate such persons as affected by the system of bonded labour. The Child Right Activist and Nobel Laureate Kailash Satyarthi observes,that country’s bright, prosperous future depends upon developing and growing up the children properly. To this end, he counts and mentions ‘Six Emergencies’ to tide over and overcome their concern like child labour. (1)Education Emergency: He says “education and eradication of child labour are the two sides of the same coin.” Illiterate children are soft target and easy catch. We should increase spending on education. Business houses should also contribute to child education. (2)Enforcement Emergency: The present situation of child labour calls for effective implementation of the laws against forced child labour, salvery and engagement of children in homes. Such children need to be brought, along with their families, into the main stream of the society. (4)Economic Emergency: These two are inter-linked, as the employment yields income and income helps raising the life and living level of the family. Economic liberation of the family is Sine qua non to mitigate the child labour. (5)Ecological Emergency: Climate change is affecting more the poor people, devastating their life and living. And children of these families are compelled to earn as labour.They need to be saved. (6)Ethical Emergency: Laws and Judicial provisions alone cannot tackle the problem of child labour. There is need to address the issue at ethical and moral levels; socially and collectively. Eminent economist Warner says that the principle reason for child labour is illiteracy of the child. He negates the factors like poverty, high birth rate and size of the family and lower economic development. He maintains, that child labour is born, created out of the inherent self-interests of the elites, and poor guardians as they earn more by this evil system. The practice of child labour can be curbed by spreading education and awareness.